Bodyweight squats can get boring for your campers really fast. Luckily, other than just adding weight, there is a lot of variations you can use to keep your bootcamps fun and interesting. Don’t be lazy though and dish out over-complicated squats to clients who aren’t ready for it. Always scale your exercises so everyone can do them. It may seem like fun to get your clients doing all sorts of crazy exercises but it won’t be so fun when half your bootcamp is missing due to injuries. For example a Tuck Jump is tough exercise. If you lack power in your legs you just end up stomping your feet into the ground each rep. Instead, if you were to plan Tuck Jump Squats (see below) into your routine you could just have the advanced clients do that, the intermediates do regular Squat Jumps and the beginners do squats. Learn more about scaling workouts here. Great for teaching clients what a low squat feels like while also mobilising them. Another great mobiliser. Start with small movements and then move into full ROM. When you don’t have dumbbells or kettlebells handy. More car tyre stuff here. Use a dumbbell or kettlebell. Touch the ground on each squat. Alternate hands each jump. A version of tuck jumps that forces clients to bend their knees and land softly. Starting in the middle, pretend you are creating a plus sign (+) on the ground. 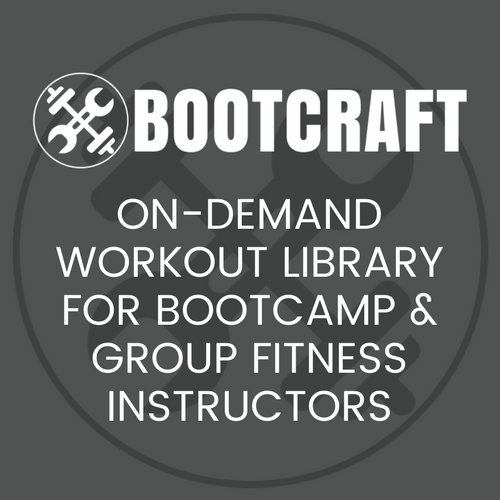 What squat movement do you love to give your bootcampers? Deck squats, Stagger squats(toe of back foot in line with the arch of the front foot), Ski squats(swing arms up out front as you go down, swing back on way up), Scap raise squats(holds arms out like scap raise- squeeze upper back hard), Squats with a big forward lean(keep a stretch in hamstrings during whole rep if you can), flowing from Squat to Lunge variations, Static holds in Squats, Starting Strength Squats(4 second pause at bottom, then, jump hard) U-Dips(boxers turning and rolling under punches…it can be a squat trust me), Slow Squats(3 seconds down, 3 up x10 reps = 1 minute), Sotts press(overhead press 2 light dumbells at bottom of ATGsquat…not easy), Squats + Duck walks. At the end of a leg workout (after everyone’s already tired), I will add in a “rocket” squat: takes 3 counts to lower into a full squat–each count lowers your incrementally–and then you hop up at the end but do not land in a squat, just in starting position. A little easier than a jump squat but still giving the legs an extra little work. Thanks for the additional squat ideas! I like to use the Sumo squat and split squat with my groups.